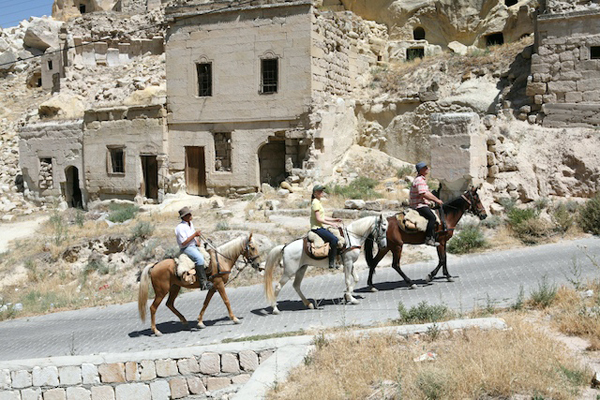 Cappadocia horseback riding travels take you through exotic terrain for history, culture, food and adventure! If you’re into exotic adventures on horseback, Cappadocia, Turkey is a fascinating destination to explore. It was on my bucket list for horseback riding vacations and I’ve since been back twice to film for our Emmy winning PBS TV show, Equitrekking, and to ride with the local people, who have since become friends. 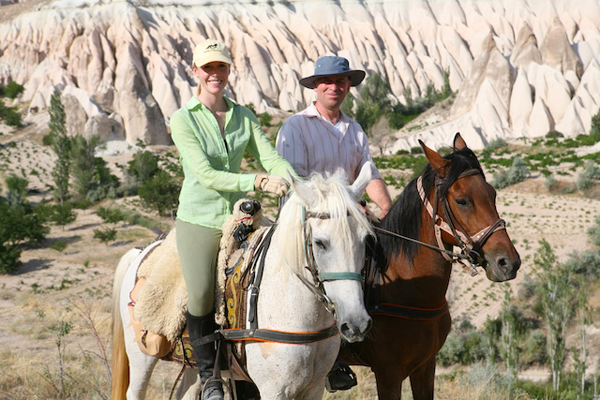 If you’re planning on traveling to Turkey to ride horses on a Cappadocia Riding Vacation, here are ten things to keep in mind and a few travel tips to help send you on your way. 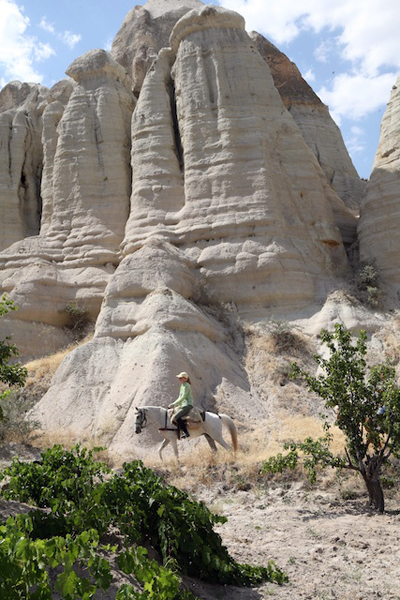 To take on Cappadocia, Turkey, you ideally need to be an intermediate to advanced level of rider and comfortable at all paces—walk, trot and canter. Sometimes you may have to get off and walk your horse, so you want to be comfortable handling horses on the ground as well. If you are a beginner, make sure to ask the outfitter to see if they have rides that are suitable for you. In Cappadocia, expect varied terrain. You may find yourself cantering on dirt trails through open fields or navigating rocky passes through fairy chimneys, bizarre rock formations for which the region is famous. Entering villages, I sometimes found myself on cobblestone streets, which can be a little disconcerting at first, but once you trust your horse and look up, you’ll be amazed at the cool architecture found in off the beaten path locales. Depending on the outfitter you choose, the horses can be tough, have good stamina and generally have a good attitude. Many times, part of the fun of traveling somewhere new to ride is experiencing a new breed of horses. The outfitter with whom I rode in Cappadocia, Kirkit Voyage, has Arabian and Barb Arab horses, which are around 14 or 15 hands high. 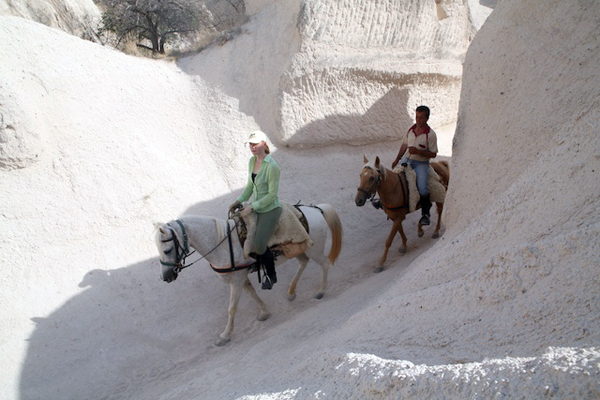 We observed a variety of tack and saddles in Cappadocia. 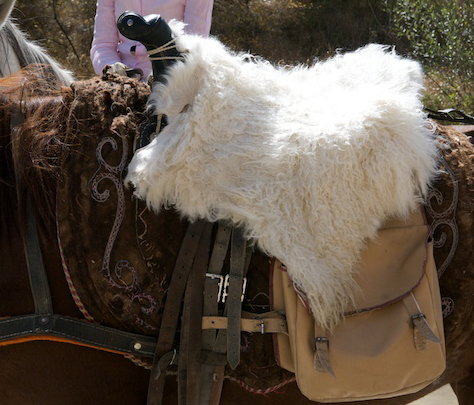 Be prepared to ride on English or endurance saddles or more exotic sheepskin saddles from Kyrgyzstan. At the Kirkit's stables where I rode in Cappadocia, they did have English style saddles, but also Kyrgyz saddles. These comfortable sheepskin saddles have a higher tree, which can be a little different for English riders who are used to close contact with your legs. You want to make sure you are a balanced rider if you choose to go with the Kyrgyz tack. I had a little trouble getting used to these saddles, as I didn’t feel that I had very much contact with my horse’s sides. I stayed with the Kyrgyz saddle for the challenge and to fit in with my local guide, but know many folks who opt for an English saddle for rides here instead. 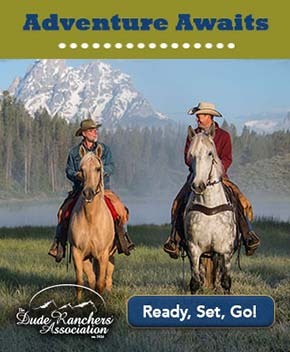 You always want to wear comfortable riding apparel for any horseback riding vacation. In Cappadocia, the sun can be intense. Be mindful that you are traveling in an area where many people are more conservative with their dress, so I suggest light, long sleeved tops. I wore riding tights with half chaps and paddock boots, just because they are comfortable and compact enough to roll up and pack. You want boots with good treads in case you do have to do some walking or want to stretch your legs while the horses take a break at lunch. All terrain riding boots work well. You might want to wear a vented helmet if you’re traveling in warmer months. Cappadocia has a dry, warm climate. Drink a lot of water and liberally apply your sunscreen and lip balm with spf. There aren’t a lot of trees for respite from the sun. Riding here is truly stepping back in time. If you are visiting smaller villages, you'll likely meet local people, who may be excited to see you on horseback. Cappadocia has some of the best food that I’ve eaten on my travels. Get ready for lots of fresh fruits and vegetables, depending on the season, strong teas, hearty soups and lots of homemade goodness. If you like hot tea, you are in for a treat. It’s often served in small glasses and can be very strong. You can usually add water if it’s not too your liking and sugar, of course. 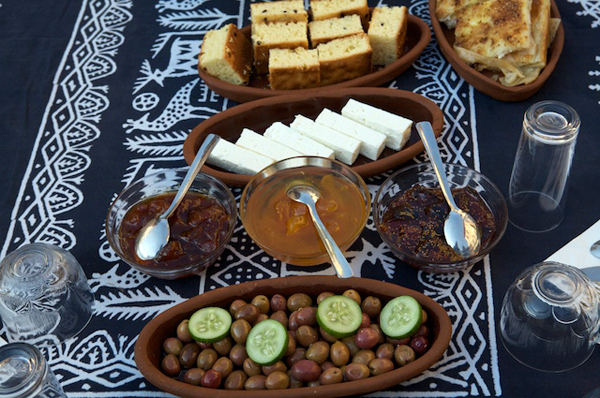 Breakfast might include Turkish tea, coffee, bread, butter, olives, tomatoes, feta cheese, honey, local jams and specialties and sometimes eggs. Get ready to eat! 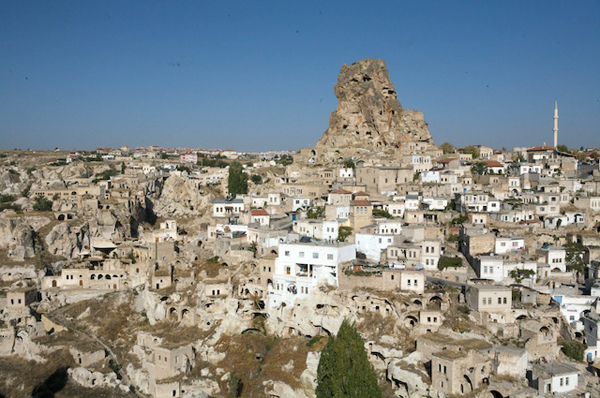 Cappadocia has a lot of cool hotels, B & B’s and pensions. 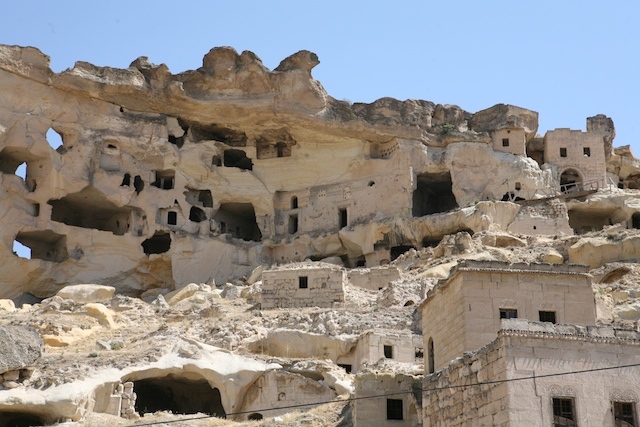 There are “cave hotels”, carved out of the area’s soft rock and whole villages carved into the sides of cliffs. Many homes and buildings were carved out of the soft rock centuries ago, as it’s a good insulator to protect against the hot summers and chilly winter days. Many old Cappadocian homes have been comfortably restored for you to experience the atmosphere of a traditional home. 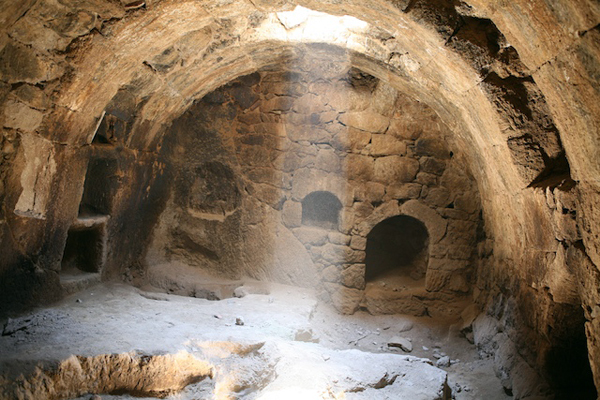 Boxy, old stone buildings with flat roofs and large arched doorways can be found throughout the region and are of similar architecture to homes constructed in Northern Syria and Upper Mesopotamia. In addition to horse riding, hot air ballooning is popular in Cappadocia, as is hiking, biking and general sightseeing. For a real treat, check out a whirling dervish ceremony. You may wake up to see a sky filled with hot air balloons. 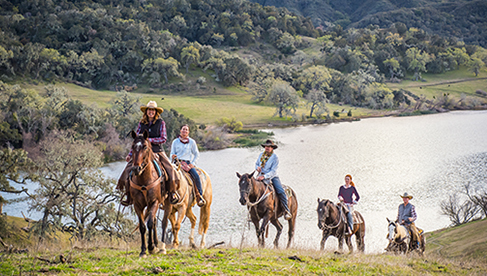 There’s a lot for non-riders to do here and for riders who want a break from the saddle. 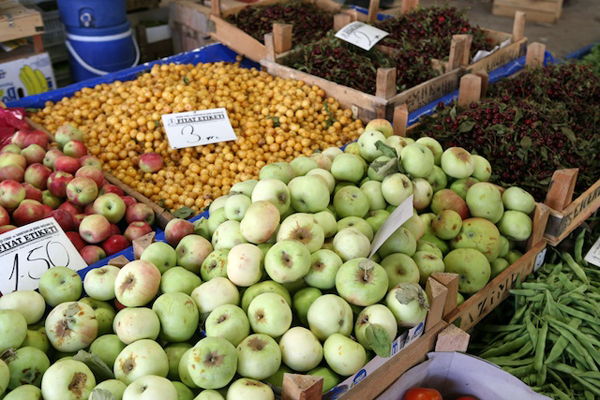 Your base cities of Avanos and Guzelyurt in the region of Cappadocia have warm days and cooler nights. Guzelyurt is at a higher elevation, so is cooler than Avanos. Over the course of each year, Cappadocia receives very little rain. In the summer, it’s hot during the day, ranging from 77º to 96ºF, and cool in the evening and at night, from 50º to 59º F.
The weather is generally nice and dry but there can be occasional heat storms. Spring can be cooler and wetter. 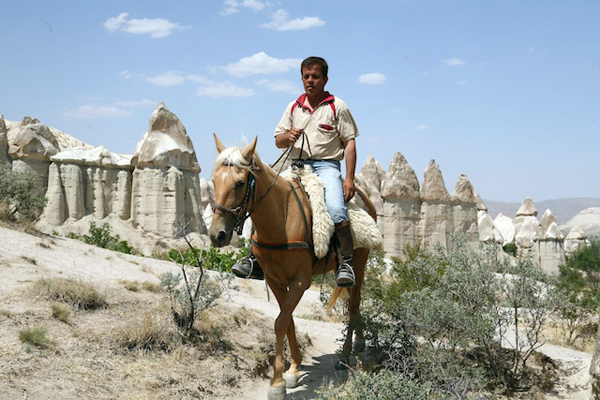 Learn more about Turkey horseback riding vacations, including upcoming dates and rates, and other Cappadocia travel adventures you can take through EquitrekkingTravel.